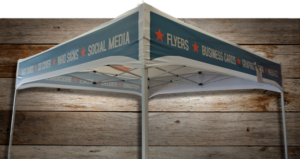 Custom printed canopies: A great way to make your presence felt at your next big trade show or event. All canopies come ready to be displayed and setting them up at your trade show, convention, seminar, convention, school event, charity, fundraiser or open house is a breeze. We have printed custom canopies for a variety of businesses such as barber shops, water treatment companies, solar panel providers, medical marijuana centers, schools, churches, and even a few gyms and local tattoo shops. We have designed and printed many tents and canopies over the years. We have become quite the canopy design experts. It might not sound like a challenging thing to design, but the angle, sides and lettering all make it a bit complicated. Our professional design team would be happy to help you with your canopy graphics call today to schedule a free consultation. Custom canopy covers are a great addition to any convention set-up. Contact us today for custom sizes and pricing. Use all four sides of your canopy, adding unique images gives your canopy a longer life. Take your canopy down in high wind area. High wind could result in damage to the canopy fabric. Put the canopy over the frame and expand the frame and tighten the canopy as you go. Carefully pack your canopy when not in use. The fabric could wrinkle if not properly stored. Add bleed to your design and make sure that the text does not run into the sides where it could potentially be cut. The fastest we can produce a custom printed canopy is 1 week. 7 days from the confirmation of digital or printed proof. Where can I use a canopy?